At the Closing Night gala of the 2010 Toronto Reel Asian International Film Festival, award-winners were announced prior to the screening of Au Revoir Taipei. Winners included Vancouver-based animator Jeff Chiba Stearns taking the NFB Best Canadian Film or Video Award for his personal documentary One Big Hapa Family. Jane Kim's Seeing Through the Spider's Web won the WIFT-T (Women in Film and Television - Toronto) Award and CFC graduate Gloria Kim received the LIFT and Fuji Best Film Award for short film The Auction. Japanese director Miwa Nishikawa won the Astral's Harold Greenberg Fund Best Film or Video Award for his comedy Dear Doctor. The Features Jury consisted of Jari Osborne, Marina Di Pancrazio and Darcy Murphy, while the Canadian and Shorts Jury was comprised of past Reel Asian filmmakers Randall Okita, Paul Wong and Mishann Lau. [UPDATE] The winner of the Reel Asian Audience Award was announced after the closing festivities. The award winner was Naoko Ogigami for Toilet. The favourite feature film was chosen by the audience by secret ballot and the award comes with a $500 cash prize. The winners of the So You Think You Can Pitch? competition were Shahrzad Nakhai and Rich Williamson (Sugar Bowl) in the Emerging category; and Tricia Lee and Ryan Reaney (Searching for Wonder) in the Professional category. The jurors for the competition were Toronto-based filmmaker Nobu Adilman, Worldwide Short Film Festival director Eileen Arandiga, and Toronto Irish Film Festival director Lila Karim. 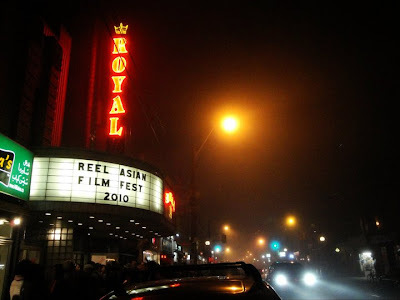 The festival concludes Monday night with an encore screening of Au Revoir Taipei in Richmond Hill. Notes from the jury: "An extraordinary work that combines home-movies, history and ﬁrst person accounts, it is a journey of self-discovery that includes the voices of 4 generations of a Canadian family. Written, directed and edited by the ﬁlmmaker, he has taken the particular and has made it universal in both form and content." - All Canadian works are eligible for this prize. Notes from the jury: "A feminist story that takes the viewer on an emotional and honest journey in which the ﬁlmmaker confronts her motherʼs veiled past." - All films made by female GTA-based artists are eligible for this prize. Notes from the jury: "This story of a beloved country doctor disguises itself as a gentle comedy before revealing itself as a provocative argument for the morality of an honorable lie." - All feature works are eligible for this prize. Notes from the jury: "An important, timely work that freshly illuminated historical, political and personal struggles and brought a brilliant combination of research and innovation into the process of reclaiming our history." - All videos made by GTA-based artists are eligible for this prize. - All feature films at the festival are eligible for this prize. Notes from the jury: "Combining multiple techniques, this ﬁlmmakerʼs ﬁrst ﬁlm has a strong and original approach both technically and conceptually, tackling a complex issue with the lightness of freshly fallen snow." - All animated films and videos are eligible for this prize. Notes from the jury: "A wonderfully rendered love letter to familial sacriﬁce and the struggle of new Canadian families." - All films made by GTA-based artists are eligible. Notes from the jury: "A crash-bang distillation of pop genres. It is a seamless mash-up of live-action, drama, anime and manga that tells a classic story of revenge and poetic justice in which violence is deftly handled." - Opportunity for broadcast on Movieola. Congratulations to the 2010 SO YOU THINK YOU CAN PITCH? Competition winners. The So You Think You Can Pitch Awards? are supported by Charles Street Video, Ouat Media, and the RBC Foundation Emerging Artists Program.